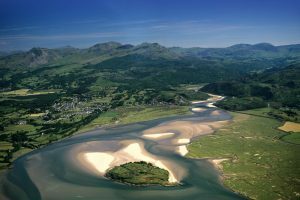 Here is a story about sailing lessons, in the estuary of the River Dwyryd in front of Portmeirion, Wales. My brother Owain was seven years old and we both loved sailing as children. This extract is from his beautiful book about childhood adventures in Wales and elsewhere and including his hiking trip down the Llyn Peninsula to Bardsey Island with schoolfriend Alan at the age of 11 years – he said they probably looked like hobbits under their rucksacks. The book is Everything I have Always Forgotten by Owain Hughes, published by Seren Books, Bridgend, in 2013 (pp 136-7). “We had two, 16-foot, open, clinker-built sailing boats, the Perrot, and The Amy. They had centre-boards of cast iron, which could be lowered and held in place with a rusty nail through a series of holes which allowed adjustment to the depth of the plate. They weighed a ton. At the age of seven I could barely drag one into position and hoist the top end so it would drop down the slot, so I did not at first use the centre-board when sailing alone….I just had to sail sideways. The iron centre-boards were supposed to have handles welded onto them, but they had long since rusted away. Once when sailing with my ‘sailing’ sister (the elder one) the rusty nail gave way and the centre-board fell through, but not all the way out. The remains of the handle stuck in the casing, thank goodness. You can buy the book here, its a great read.